Great collection! Photo is of one of 5 varying lots. This stamp has neither cancel, and it is considered UNIQUE as there are no other mint examples that have turned up in more than 90 years. A terrific opportunity to acquire a certified World Class Rarity. IF THEY ARE SHOWN ON AN ALBUM PAGE THE ALBUM PAGE IS INCLUDED. We are not a professional stamp dealer or stamp expert. I do not even own a Scott catalog. Bolivien MiNr. Land: Bolivien. Motiv: Olympiade 1980 Lake Placid. Fehlen Ihnen noch Binder von Leuchtturm, Kabe, Lindner oder Safe???. The pages are complete for the period. Blocks Mondlandung einwandfrei postfrisch. Souvenir Sheets Moon Landing mint never hinged. Mitglied der Initiative "Fairness im Handel". Katalog-Nr. : Block 92. Jahrgang: 1980. The first phase in the history ofCruzeiro do Sul is related to the German influence and can be dated from 1927 until 1943. In fact, between 1 June 1927, when Condor Syndikat ceased to exist, and the foundation of Syndicato Condor, services were never interrupted. No Exclusions. Condition: Mint Never Hinged. Date of issue: 16 March 1979. Up for auction is a beautiful early airmail cover from La Paz Bolivia To Aarau Switzerland . Priced to sell. Postmarked 1941. Cover is in good condition . Via panagra lap condor Shipping will be a flat $3.00 within the continental U.S. for USPS mail. 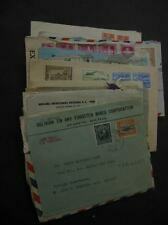 Overseas airmail shipping is $17.00. Questions? Please contact me at: azteccollectables at hotmail.com. Check out my other online auctions of rare and vintage stamps. Please make pay arrangements within 72 hours of winning the auction. I will combine shipping on multiple wins, if you want combined shipping wait until I invoice you. Seltene Tiere einwandfrei postfrisch. Wild Animals mint never hinged. 14 April 1940 La Paz to Detroit FAM 9 to New York. Katalog-Nr. : Block 96. Mitglied der Initiative "Fairness im Handel". = MH = neuf avec charnière / mint hinged. = MNH = neuf sans charnière / mint never hinged. B = F = bon / fine. ST = standard / average. O = oblitéré / used. Un certificat d'expert engage celui-ci sur l'authenticité de la pièce signée. Mint & Used collection on pages with many Better. Doing that is against U.S. and international laws. Nice usage before World War II. Addressed to Hans Marum who was the son of Ludwig Marum- a Jewish Weimar government representative arrested and murdered by nazis in 1934. Bolivien MiNr. Land: Bolivien. Motiv: Eisenbahn. Fehlen Ihnen noch Binder von Leuchtturm, Kabe, Lindner oder Safe???. NH=MINT UNHINGED. LH=MINT LIGHTLY HINGED. OG=MINT, MORE HINGING THAN LH. HR=MINT, GLASSINE HINGE REMAINS. NGAI=NO GUM AS ISSUED. USED=CANCELLED.